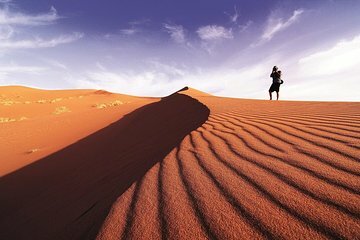 This overnight trip to the Sahara Desert is ideal for travelers without enough time for a multi-day excursion. With convenient hotel pickup in Marrakech and transport by air-conditioned coach, plus accommodation with dinner and continental breakfast, all of the details are taken care of. From Zagora you’ll ride a camel to your Berber camp under the stars. Not very happy with this tour. The driver did not speak English!! The van had no air conditioner-it was broken!! I have a video-that if you want to see it confirms what the driver did-cross a river and then we got stuck!! We had to climb out of the mini bus and were rescued by fellow travelers!! The group was so angry. Some people had the luxury tents???? didn't even know these existed?? They also had toilets and not holes in the ground like we did!! We arrived to ride the camels in the dark at 10:30 p.m.!! not ideal. I'm sorry but I would not recommend this tour at all.